There's one less pile of petroleum coke being stored on the Detroit riverfront. 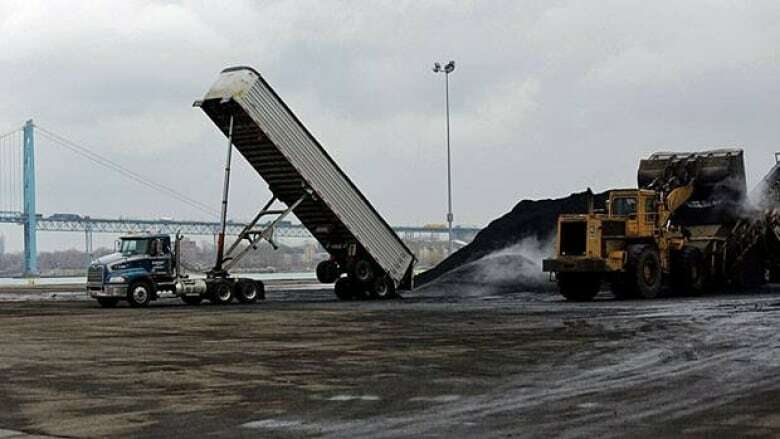 Nicholson Terminal and Dock Company, which manages operations at storage site southwest of the Ambassador Bridge, has reportedly decided to no longer accept pet coke on the site. An official with Detroit's Environmental Affairs Department tells CBC News the final shipment was removed last Sunday. Michigan State representative Rashida Tlaib said there are still concerns about the remaining pet coke pile, which is the most visible mound for residents. "Mayor Bing needs to do more to stop the petroleum coke piles on the riverfront," Tlaib said. "I have not heard him say one word. Not one word about the petroleum coke piles. Not for it. Not against it. He's completely silent." Tlaib said no permits have been granted by the city for any storage of pet coke. She said the people she represents get covered in pet coke dust when the wind blows. Similar complaints have been made in Windsor, across from the piles. "They open their windows because they don't have central air and literally right behind where they live and breath and sleep is the petroleum coke pile. I don't think this is right for Detroit," she said. Calls to both Nicholson Terminal and Dock Company and Detroit Bulk Storage Company were not immediately returned.